Knowledge representation from statistical analysis of large textual corpora has first been a matter of inquiry in the 60′s with first scientometric studies. New methods from complex network analysis and the growing availability of numeric data have put new life in this research field, allowing to build conceptual maps in completely new arenas such as the blogoshere. Beyond direct applications offered by knowledge mapping (scientometric studies, or even webometry, quantitative epistemology, intelligent browsing into large database), measuring contents is also a necessary step to better understand the dynamics of social systems. Measuring proximity between linguistic items require to take into account natural language specificities such as polysemy and heterogeneity of genericity/specificity indexes. 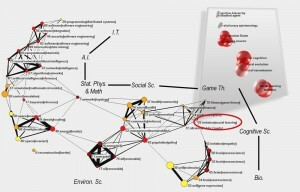 After having defined a proximity metric, it is possible to map the scientific landscape made by the aggregation of publications over time, as a multi-level object, featuring at the micro-level: a lexical network made by terms or key phrases linked according to their semantic distance, at the macro-level: a network of thematic fields defined as the groups of cohesive items of the lexical network. Beyond the application to scientific datasets and adding heterogeneity to the maps, one can also use mapping methods to try to characterize differences in the way various types of actors express their views on political issues in online forums for example. Understanding semantic dynamics of knowledge networks at every levels necessitate to track thematic fields (defined as sets of key-phrases) at successive periods of time. The reconstruction of thematic fields evolution allows to build a phylogenetic network of thematic fields whose structure may inform us about knwoledge networks dynamical patterns. 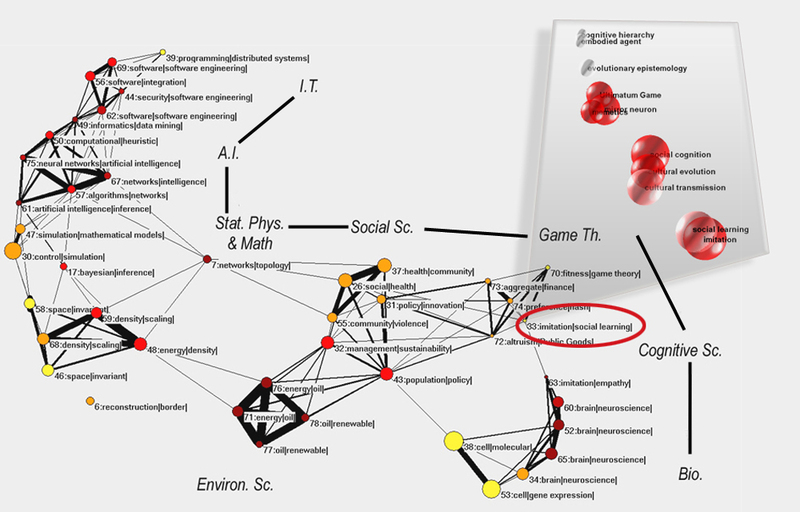 Mapping contents produced by knowledge communities also helps to better characterize semantic positionning of actors. Based on the same metrics, content published by each actors, or even group of actors, can easily be projected on these maps, or even on phylogenies. This high-level description of themes at stake in a knowledge network is then an opportunity to study conceptual trajectories of authors.